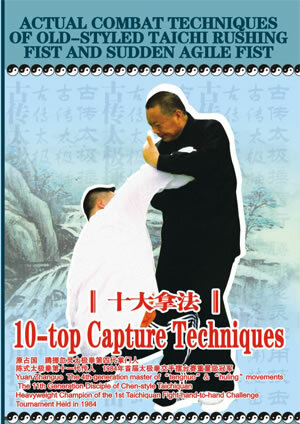 The 10-top Capture Techniques are based on the Taichi principle of dexterously harnessing the enemy's force. Each technique displays the essence of Taichiquan. By virtue of the mechanics of anthropotomy, lever centrifugal force and volution force, this film displays the essence of old-styled Taichiquan in actual combat by explaining how to skillfully capture the back of hand, wrist, crotch and shoulder, etc.